When I was in the 5th grade I had a beloved sticker collection. Each newly acquired sticker was kept in tact and pristinely placed into a giant photo album where it was safely kept under the shiny plastic to be admired over and over again. I never used any of my stickers (like actually stuck them on anything) and the bigger, puffier and shinier the sticker; the more it was valued. Unicorns and rainbows were hot commodities along with the amazing sheets of scratch and sniff stickers found at the local teacher aid store. 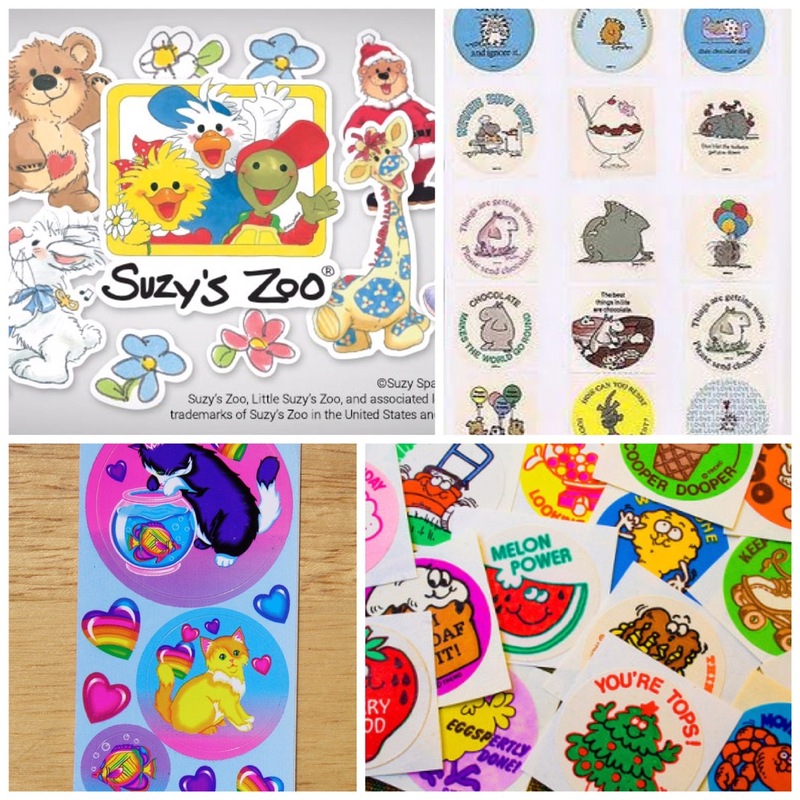 Gift shops and drug stores would sell individual designer stickers by Lisa Frank, Suzy’s Zoo (my favorite) and Sandra Boyton. I would save my money so I could buy these special stickers for my collection. It was a big event to go to the mall to buy new stickers. What a thrill to tear the newly found sticker off of the roll and then find the perfect spot for it in my book! Designer stickers from the 1980s. Pictures of my sticker collection. ﻿Other coveted stickers in my collection included Garfield, Pac Man and Snoopy. My friends and I would trade stickers on the playground during recess and get together to admire our collections after school. I belonged to the Lisa Frank fan club where I was matched with a sticker pen pal. We wrote letters to each other and even traded stickers through the mail! I was the shining example of a ten-year old sticker addict! Fast forward thirty-five years and I am a forty something with a two-year old little girl who is obsessed with stickers! 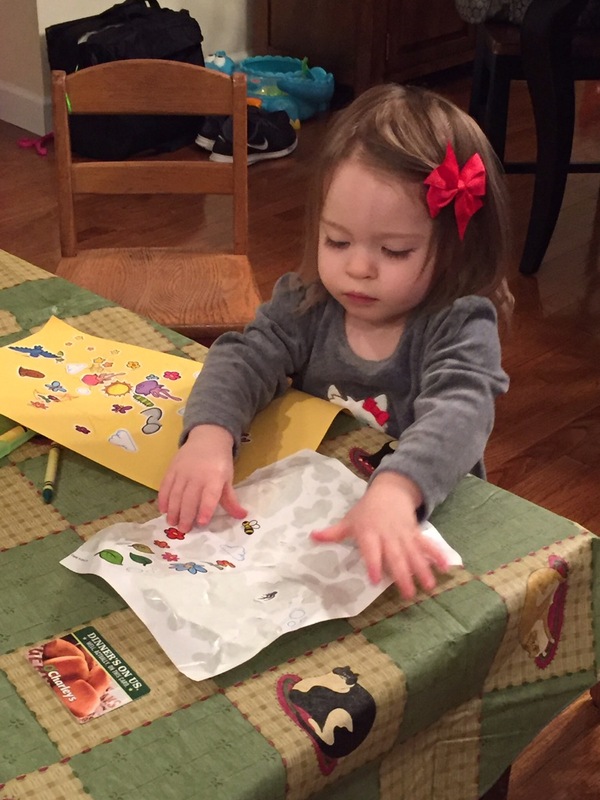 But unlike her mommy, Lillian gets a thrill from eagerly ripping the stickers off of the sheet and sticking them onto everything! Every time I see her do this my ten-year old self (who never dared to use any of her stickers) cries out with a silent Aggghhh!!! She puts stickers on her clothes, on her beloved stuffed Sweetie Pie, and all over her toys. So there are stickers everywhere! Stickers are stuck to our hardwood floors, in the carpet and one night I even found a sticker in my hair! 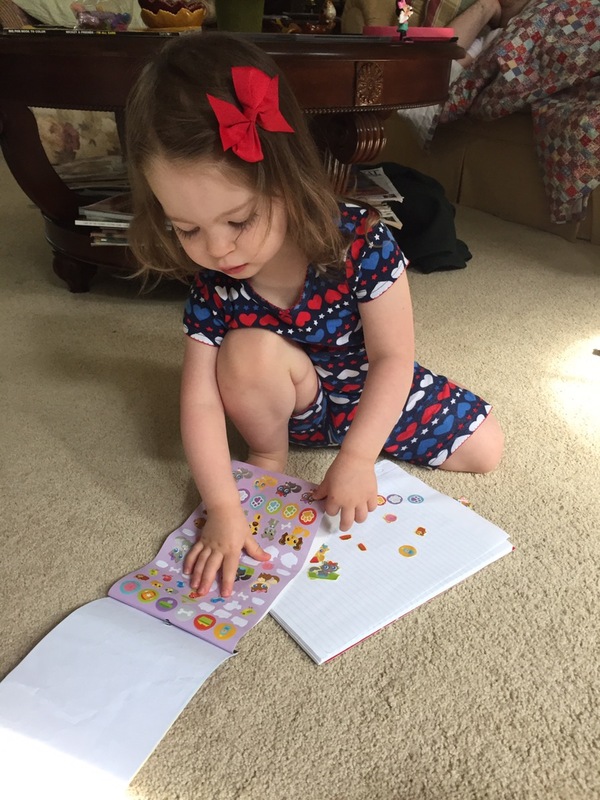 Lillian likes to share her stickers with the people she loves; never expecting anything in return. Visitors leave our house adorned with stickers. I have shown up to multiple rehearsals with a sticker clad shirt and daddy went to work one day only to discover at lunch that he had spent the entire morning sporting a Minnie Mouse sticker on his tie! And she doesn’t discriminate when it comes to stickers. As long as they are sticky she is in love! In fact anything adhesive is viewed as a sticker. Last week we went to our local post office to mail a package. While there I picked up a sheet of stamps. Not even thinking I let Lillian pick them out. She got the biggest grin on her face when the nice lady behind the counter handed her a new sheet of “stickers.” She began to rip the expensive stickers off of the sheet while I frantically explained these were special stickers, called stamps, that are used to mail things to people. To my relief, she willingly traded her new sheet of “stickers” for some Goldfish crackers and I celebrated the fact that I successfully prevented a $9.80 mistake from happening! A huge smile appears on her face when the cashier at Target, or one of the grocery stores we frequent, gives her a sticker as we pass through the check out. The little girl in me gets excited when we go to Trader Joe’s. Trader Joe’s has the best stickers! They give each tiny shopper an entire roll of stickers and the stickers are often seasonal and witty, so there is something to be enjoyed on multiple levels. For Thanksgiving they gave out scratch and sniff stickers (for free) and the little 80’s girl who used to save her money to buy stickers could barely contain her excitement! 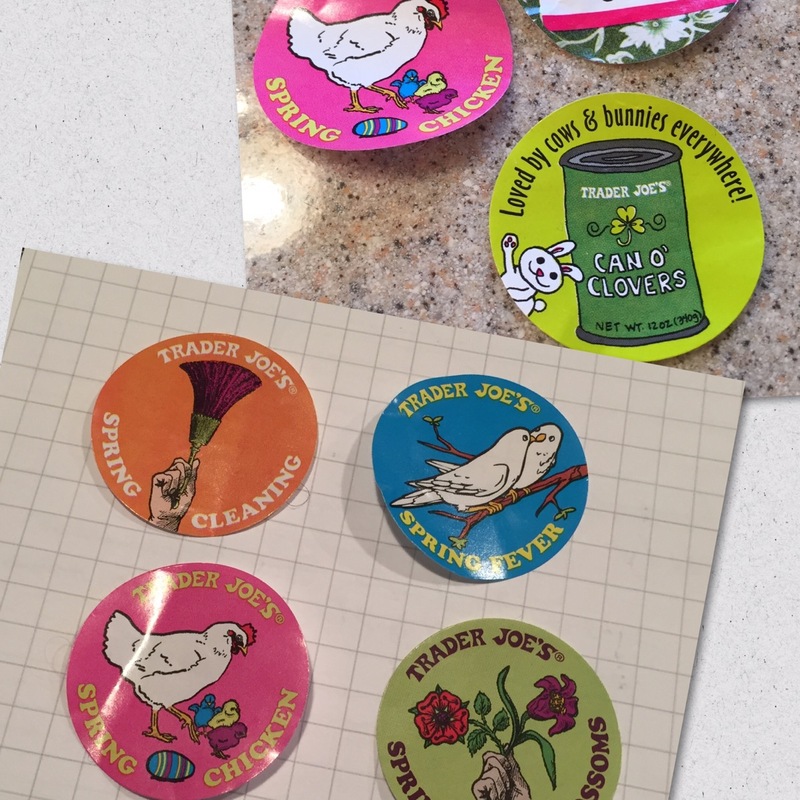 Back in the day the stickers Trader Joe’s gives out would have been a coveted addition to my growing sticker collection! 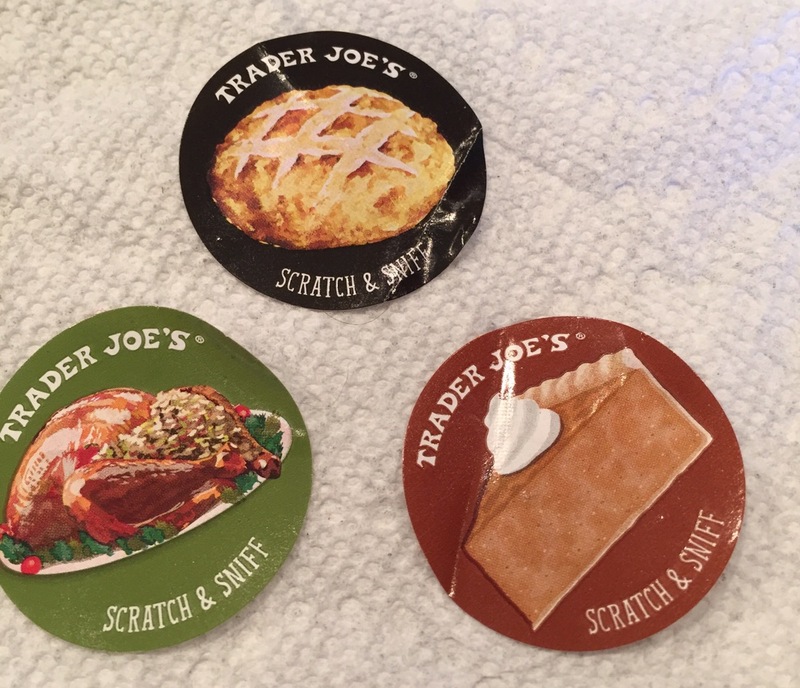 The fun stickers from Trader Joe’s! My old sticker collection is a childhood treasure I am excited to pass down to Lillian. I plan to wait a few years before I give her my cherished possession. Although I would enjoy seeing the excitement on her sweet little face, I would find absolutely no joy in peeling my beloved collection off of our hardwood floors! Wow, some of those look familiar! I was guessing we were the same age, then you confirmed it. 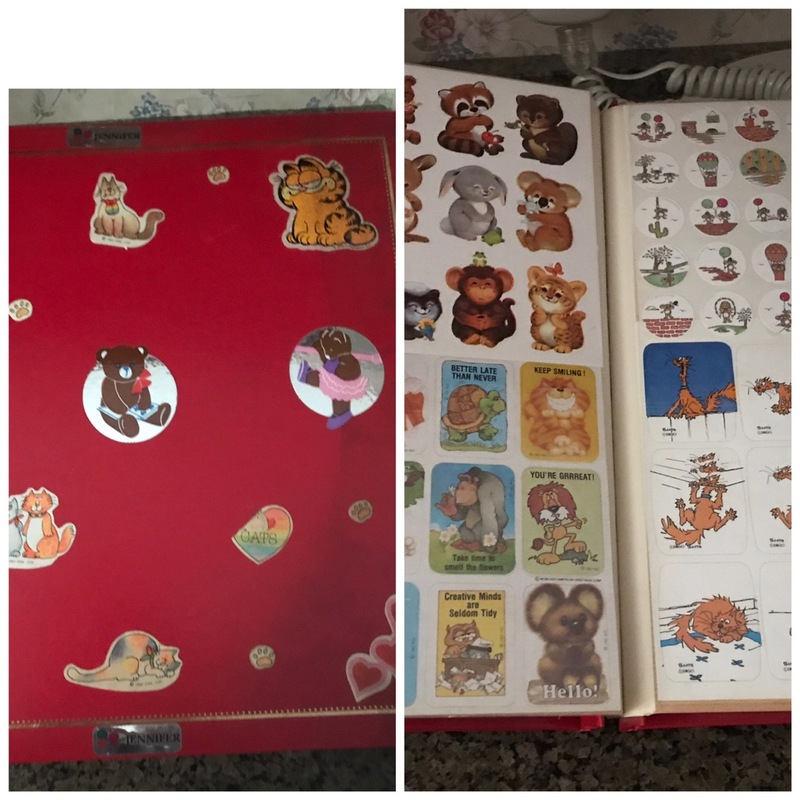 I had one of the sticker albums with the slick pages that you could, in theory, peel the stickers off of if you changed your mind. Wonder what happened to that…. These days, Washi tape from the Dollar Tree gives me that same rush I used to get from visits to the Hallmark in the mall. I feel like you are describing me and my daughter. I had about seven sticker books that I loved and I actually still have in a box somewhere. My daughter sticks them literally everywhere and uses them as band aids for her toys.